Starting a 501(c)(3) nonprofit/NGO in New York can be an overwhelming process, involving review at both the state and Federal government levels. This guide will help you navigate some of the complexities involved. Difference Between the Terms “501(c)(3),” “Nonprofit” and “NGO” in the United States. A nonprofit is an organization formed for a primary reason other than profit. Prior to 2014, New York categorized not-for-profit corporations created under its laws as type A, B, C or D, nonprofits; since the law was amended, nonprofits formed in New York are classified as charitable or non-charitable. An NGO is a nonprofit that is not controlled by a state or a government (i.e., civil society). A 501(c)(3) refers to a nonprofit formed exclusively for “charitable, religious, educational, scientific, literary . . . and other exempt purposes under section 501(c)(3) of the IRS code. Now that we’re clear on the differences, this guide is aimed at forming an organization that fits the criteria of 501(c)(3), nonprofit and NGO (most nonprofits in the United States fit this criteria). Additionally, it is focused on forming a NY not-for-profit corporation with 501(c)(3) status (while this status can be achieved by certain trusts, LLCs and unincorporated associations, the most streamlined and most used nonprofit structure is the corporation). Register as a New York charity. The first step on the journey towards creating a 501(c)(3) tax-exempt New York Not-for-Profit Corporation is to put together a team and make a plan. In putting together your team, you will want to think of the role or roles each team member will serve, including as directors, officers and resource persons. New York law requires nonprofit corporations to have a minimum of three directors, so the road to 501(c)(3) is not a journey you can take on your own. You might ask, “Some states will allow fewer directors, so why not form a nonprofit in a different state with more lax requirements?” While it is true that several states will allow a nonprofit to have just a single director, the 501(c)(3) tax-exemption is granted by United States Internal Revenue Service (IRS), not any particular state. While not explicitly stated in any law, the IRS prefers a nonprofit to have at least three directors who are not related by blood or business, and will routinely deny 501(c)(3) status to nonprofits with only one director or two related directors on the basis of the risk of “private inurement” because of the lack of independence in control. See, for example, IRS Private Letter Ruling 0736037. In addition to directors, you will also need to decide who will serve as officers. At the minimum, a President, Secretary and Treasurer will need to be appointed by the directors (who can also serve as officers). Many non-profits also will appoint an Executive Director, who functions as the Chief-Executive-Officer (CEO) of the organization. Lastly, you will need to think of who will serve as good resource persons. These are people who can help with brainstorming, fundraising, raising awareness, and planning and implementing the activities of the nonprofit. Once you’ve assembled your core team, together you will need to create at least a skeletal business plan for your NY nonprofit. The objective of this exercise is to clarify what the mission and vision of the nonprofit will be, and what activities, services and programs the nonprofit will run to achieve its vision. In determining your New York nonprofit’s activities, services and programs, in addition to giving due regard again to the public benefit and exempt purpose considerations mentioned above, you will also want to think about how fundraising will be done and whether your nonprofit will be involved in lobbying of any kind (depending on your 501(c)(3) tax-exempt classification, your nonprofit may be absolutely prohibited from lobbying). PROTIP: “Lobbying” and “Advocacy” are not necessarily the same thing. Another important component for your business plan is a projected budget for at least 3 years. This information will be needed to apply for 501(c)(3) tax-exemption. Before forming a New York nonprofit, you will need to name it. In New York, apart from charitable and religious nonprofits, the names of most not-for-profit corporations must end with “incorporated,” “corporation,” “limited,” “inc.,” “corp.,” or “ltd.” The name of your nonprofit must also be unique enough to differentiate it from other NY entities, both nonprofit and for-profit. There are a few words and phrases that cannot be used as part of the name of a NY nonprofit corporation, and certain words can only be used if permission is obtained from an appropriate official. Section 301 of the New York Not-For-Profit Corporation Law, together with Section 404 of the same, provides guidance on prohibited and restricted terms. Once you’ve decided on a name for your New York nonprofit, you’ll need to check to see if the name has already been used. The quickest way to do so is to use New York’s Corporation and Business Entity Database. But be aware that it is not updated every day. The Department of State charges $5 for a current name search, but running one is usually not practical. If there is a concern that the name you want will be taken before the Certificate of Incorporation for your not-for-profit corporation is filed (the next step), you can request the New York Department of State to reserve the name for 60 days by filing an Application for Reservation of Name. Once you’ve decided on a name, it is time to put together the Certificate of Incorporation for your nonprofit and to file it with the New York Secretary of State. In preparing the Certificate of Incorporation, you should also refer to Section 404 of the New York Not-for-Profit Corporation Law, as special approvals may be required for your New York nonprofit, depending on its mission and vision. The New York Department of State’s website also provides a free NY Not-for-Profit Corporation Certificate of Incorporation form. Please be aware that the form does not contain all the optional provisions that are available under New York law. For a 501(c)(3), the purpose section of the Certificate of Incorporation should articulate the mission of your nonprofit. Additionally, in order for your nonprofit to receive 501(c)(3) status, your Certificate of Incorporation must also include special 501(c)(3) language. The IRS has provided a sample Articles of Organization with suggested language in Articles Fifth and Sixth. 501(c)(3) Private Foundations have more restrictions than 501(c)(3) Public Charities. Some of these restrictions may need to be addressed in the Certificate of Incorporation of your New York nonprofit. Sample language, provided by the IRS, can be found here. A registered agent is not required in New York, since in New York the Secretary of State must be designated as agent for service of process. However, if having a registered agent is desirable for your New York Not-for-Profit Corporation, the name and address of the registered agent should be specified in the Certificate of Incorporation. The nonprofit corporation Certificate of Incorporation needs to be submitted with a cover sheet (included in the forms) which basically lets the Department of State know who to send the filing receipt to. When complete, mail the Certificate of Incorporation and cover sheet, along with a check for the filing fee ($75 at the time of this posting) made payable to the “Department of State” to Department of State, Division of Corporations, One Commerce Plaza, 99 Washington Avenue, Albany, NY 12231. It normally takes about one to two weeks for the New York Department of State to file the Certificate of Incorporation for your nonprofit corporation. If you would like to expedite the process, New York will do so for an additional fee. It costs an additional $25 for processing within 24 hours, $75 for same day processing, and $150 for processing within 2 hours. We normally use 24 hour filing, unless clients request otherwise. To request expedited filing, you send a separate check for the expedite fee (which is non-refundable) and a cover letter requesting that the process be expedited, along with the Certificate of Incorporation to be filed. You will need certified copies of your NY Nonprofit’s Certificate of Incorporation to open a bank account and to apply for the 501(c)(3) tax-exemption. New York charges $10 per certified copy, and you should request at least two when you file. Like the expedite request, certified copies are also requested for through a cover letter. Once mailed, the Nonprofit Certificate of Incorporation will be examined by the New York Department of State for compliance with New York law. Hopefully, at the end of all this, you will receive certified copies in the mail. Congratulations! 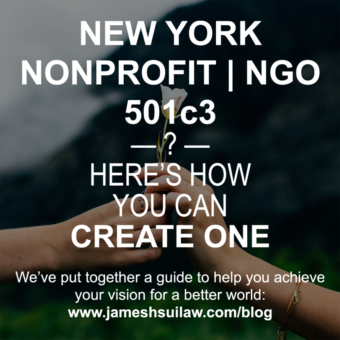 At this point you have a New York Nonprofit/NGO, and have come a long way on your journey towards 501(c)(3)! Great! New York has approved the formation of your not-for-profit corporation. You’ve cleared the hardest part at the state level. Now it’s time to start working towards the 501(c)(3) status. The first step on this next leg of the journey is preparing the bylaws for your nonprofit. Directors: How will directors be elected? What qualifications do they need to have? How many will there be? How long will they serve? What happens if they need to be removed? What rights and obligations do they have? Officers: How will officers be elected or appointed? What qualifications do they need to have? What are their duties? What are their titles? How long will they serve? What happens if they need to be removed? What rights and obligations do they have? Members: Will the organization have members? What is required in order to become a member? Are there different levels of membership with different privileges and obligations? What is the role of members in decision making? Committees: What types of committees will the nonprofit have? What is required for additional committees to be formed? What is the composition of committees? What role do committees play in decision making? What are their responsibilities? What are they prohibited from doing? Decision Making: Where and when will meetings be held (a New York nonprofit must hold at least one annual meeting of directors, and in the case of nonprofits with voting members, one annual meeting of members)? How much notice must be given before a meeting? Who can call a meeting? What other procedures are necessary to call a meeting? How many must be present for decisions at a meeting to be valid (quorum)? Can decisions be made without a meeting? What number of votes are needed to make a decision at a meeting (or by written consent)? Are there different votes required for different decisions? What happens if there is a deadlock in voting? Can directors (or members) vote by proxy? Policies: The IRS very strongly suggests that 501(c)(3) nonprofits adopt a conflict of interest policy and has provided a sample policy in the IRS Form 1023 Instructions. Thanks to the Enron scandal, U.S. law (the Sarbanes Oxley Act) also provides certain protections to corporate whistleblowers and prohibitions against document destruction, which apply to nonprofits; although having applicable policies are not required. However, regardless of U.S. law, New York requires all its nonprofits to adopt a conflict of interest policy, and also requires those that have received over $1,000,000 in a fiscal year and that have 20 or more employees to adopt a whistleblower policy. There are many other policies that could apply, but beware — worse than not having a policy is having one and not adhering to it. Controls: Who is authorized to sign contracts? Who is authorized to sign checks? Who is authorized to exercise the nonprofit’s right to vote as a shareholder? If there are members, what are the procedures necessary for a member to exercise the right to inspect the nonprofit’s books and records? Authorize opening of bank account and financial controls. All the above actions should be properly memorialized in a set of corporate minutes. While the Certificate of Incorporation serves as your nonprofit’s birth certificate, the EIN serves as its social security number. The EIN is a unique identifier which must be provided in your New York nonprofit’s 501(c)(3) application, and in all Federal and many state filings. It is also required to open a bank account for your organization. To obtain an EIN, a responsible party, who must be someone with control over the nonprofit’s finances, must be identified. If the responsible party has a Tax ID number, such as a social security number or individual taxpayer identification number, an EIN can be obtained via an online application, for free, in literally 5 minutes. If the responsible party does not have a Tax ID number (e.g. lives outside the United States and has never had any reason to obtain one), the EIN must be obtained through the paper application, IRS Form SS-4. Application procedures in this case can be rather complex and it is highly recommended that you hire an attorney or other professional to help you. OK! Armed with a business plan, certificate of incorporation, bylaws and EIN for your New York not-for-profit corporation, you are now ready to take the leap into 501(c)(3) territory by preparing Form 1023. There are two versions of Form 1023, an expedited Form 1023-EZ and a much more extensive Form 1023. Nonprofit is categorically prohibited from using the form (e.g. schools and churches). If using 1023-EZ, it is very important to go through the checklist to make sure your nonprofit NGO qualifies to use the form, and to answer the questions very carefully in the form. In reviewing the application, the IRS is looking for a reason to quickly reject the application. The IRS estimates that the full Form 1023 will take non-experienced persons at least 100 hours to complete. If you’ve followed all the above steps, you will be well on your way towards creating your New York 501(c)(3) nonprofit NGO. Form 1023 will be used by the IRS to determine if your organization qualifies for the 501(c)(3) tax-exemption. It will also be used to determine whether the organization is a Public Charity, Private Operating Foundation or Private Foundation. From an operations standpoint, the Public Charity is the least restrictive in terms of activities and use of funds, while the Private Foundation is the most restrictive. Just like the “EZ” version of the form, it is very important to take your time and think over your answers in Form 1023. The IRS is looking for reasons not to approve the application. If not answered sufficiently, the IRS will follow up with questions and approval could be greatly delayed; if answered wrongly, the application will be rejected, the filing fee lost, and reapplying will be extremely difficult (it is sometimes easier to use a whole new NY nonprofit corporation than to try and save one that has been rejected). As of February 2018, the filing fee for Form 1023-EZ is $275, and $600 for the full Form 1023. Processing time will take from 2 weeks to a few months depending on the form you used, how long your application was, how well it was written, and what activities and programs your New York 501(c)(3) nonprofit NGO will have. If all goes well, you will receive an Affirmative Determination Letter from the IRS as proof of your New York nonprofit’s 501(c)(3) status. Last step! All charities operating in New York must register with the Charities Bureau of the New York Attorney General’s office. This is done by filing Form CHAR410. If you have the IRS Determination Letter proving your New York Nonprofit’s status as a 501(c)(3), the application is quite straight forward, and involves resubmitting what was submitted when you applied for the 501(c)(3) tax-exemption. Congratulations! Mission accomplished! You now have a New York 501(c)(3) Nonprofit NGO. Now go change the world! As a 501(c)(3) Nonprofit NGO, your organization is exempt from many Federal taxes and certain state taxes (such as property taxes). However, an additional step is required to obtain a tax exemption certificate for sales and use tax in New York. This is done by filing Form ST 119.2, along with your IRS 501(c)(3) determination letter, with the New York State Tax Department, Sales Tax Exempt Organizations Unit. Additionally, to obtain a franchise tax exemption for your nonprofit (i.e. the annual tax on corporations), you will need to file Form CT-247, along with your IRS 501(c)(3) determination letter, nonprofit corporation certificate of incorporation and bylaws, to the New York State Tax Department, Corporation Tax office. This blog post is provided for general informational purposes only. It is not legal advice, and should not be a substitute for legal advice. If you have questions or comments about the post, or would like to learn more about something in the post, please feel free to contact me. Additionally, you may be interested in taking a look at my New York nonprofit law services. Thank you for this amazing guide for creating a NY nonprofit. It helped me to understand the process so much more! Next post:How Many Directors are Needed on a Nonprofit/501(c)(3) Board?